These were the most important words spoken to me when I was going through my own high conflict divorce some 13 years ago. My therapist’s advice changed the way I thought about nearly everything that happened from that point forward and, most importantly, how I reacted to events during the 2-1/2 year divorce process. If you have been caught up in the long and painful path of a high conflict divorce you will probably agree with these statements. If you are just beginning the divorce process, please take time to reflect on these statements. I believe they will save you great pain and help you find your way through this most treacherous time. 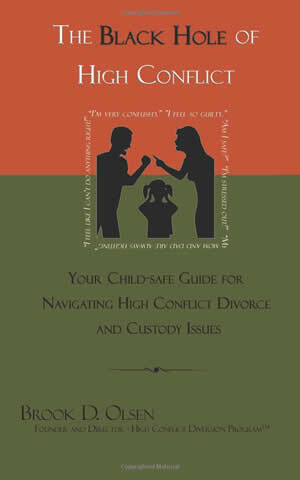 If you are reading this material you are likely someone who is looking (or knows someone who is looking) for answers regarding the cycle and traits of a high conflict divorce. In the pages to come I will give you a perspective that you may not hear from the established minds in the worlds of family law or mental health. My goal is to offer you a highly effective process to navigate through high conflict divorce, and get you to think outside of the traditional “box”. I have developed leading-edge strategies that have been enormously successful in helping clients and students through the maze of high conflict divorce. Most Family Court professionals believe that all parents have to find a way to co-parent and generate orders that reflect this, even in the face of clear evidence that in high conflict situations, co-parenting only makes the problem worse. These beliefs about co-parenting are based on the normal behavior of the vast majority of separated parents (around 70%). Parents in the remaining high conflict group (around 30%) are not capable of co-parenting in the traditional sense. Familiarizing yourself with the traits and behaviors of high conflict personalities is probably the single most important undertaking necessary to changing the way YOU think, react and behave when it comes to dealing with the other parent. It isn’t advanced psychology to state that most all of our worldviews and behaviors are a product of our history. Examining the history of your relationship, as well as any childhood issues experienced by you or the other parent, will help you not only understand better the other parent’s point of view, but will give you a good predictor of the behavior to come. This book will change how you think and what you believe regarding the family court system, and free you from the recurring nightmare of being entangled in a fight that makes no sense. It is not intended to be digested in one sitting. Exercises are included at the end of each chapter and will require extra time and effort. If you choose to use them, they will enhance your understanding and effectiveness of the material presented. These are contemplative exercises of the material presented in each chapter.